Presented by Delou Africa Inc. The 3rd annual African Diaspora Dance and Drum Festival of Florida presented by Delou Africa Inc. is set be a high-spirited three-day event that will heighten the awareness of African culture through captivating traditional African dance, drum, music and history. 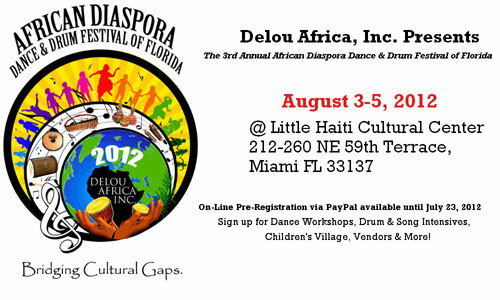 The festival takes place on August 3-5, 2012 at the Little Haiti Cultural Center (212-260 NE 59th Terrace Miami FL 33137). The 3rd annual African Diaspora Dance and Drum Festival of Florida is under the artistic direction of Delou Africa Inc.’s and Delou African Dance Ensemble(D.AD.E. ), Executive Director Njeri Plato-Dioubate and also Ibrahima Dioubate who is the company’s Griot and musical consultant. "It is a joy to see people from all walks of life children and adults coming together to experience the rich traditions of African Culture through dance, drum, music and history. My dream has become a reality” states Njeri. Visit http://adddff.delouafrica.org/ for schedule and workshop prices. Copyright © 2003-2019 TriniJungleJuice.com™. All rights reserved.